To see the animated image scroll down to the first comment (below) or view original size (800 x 800; look above in the "actions" menu). The Library of Congress website offers a multitude of historical images, many with no known restrictions on use. 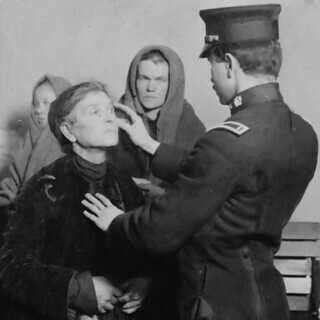 This image is derived from the 1911 stereograph depicting Physical examination of female immigrants at Ellis Island, New York City. Related images are shown below (in the first comment). The purpose here is not to duplicate the original image, from the Library of Congress website, but to generate a downloadable animated gif to assist viewing and presentation. This is believed to be fair use. The original image is copyright 1911 and may be in the public domain. According to Wikipedia works copyrighted before 1978 have a maximum copyright duration of 95 years. LOC image page: www.loc.gov/pictures/item/95506353/ . The source image received aggressive noise reduction (NoisewarwPro) then a darker duplicate (darkened by adjusting the gamma) was generated and blended with the original (Hard Light filter, PictureWindow Pro). Subsequent image manipulations and gif generation done with StereoPhotoMaker, a freeware program by Masuji Suto & David Sykes.